FW Artists’ Ink is an acrylic-based, pigmented, water-resistant ink (on most surfaces) in a range of 38 colors, all of which have either a 3 or 4 star rating for permanence. Such a high degree of lightfastness over such a range of fully intermixable colors makes them ideal for use by artists in the production of pictures for permanent display. Equally, however, colors can be substantially diluted to achieve the most subtle of tones, very similar in character to watercolor. Such washes will dry to a water-resistant film on virtually all surfaces and successive layers of color can be laid over. 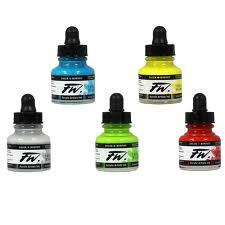 FW Artists’ Inks work well through airbrushes, technical pens, dip pens, and brushes.